As someone who lives in possibly the least walkable city on the planet, this is a subject dear to me. When I travel, I don't go to beaches; I go to cities where I can walk. 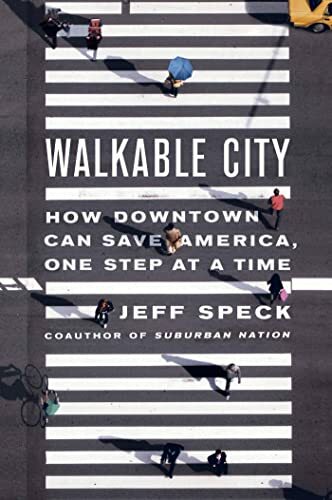 Jeff Speck is an architect and city planner, and in Walkable City: How Downtown Can Save America, One Step At A Time, he makes the case for cities serving the needs of people, not of automobiles. In an engaging voice, he tells how our cities became unwalkable, why it makes financial, environmental, and health sense to make them pedestrian- and bicycle-friendly, and how it can be done fairly easily. When I was living in Smalltown USA in the '60s, downtown was the place to be. Wonderful small shops, a barber with a twirling red and white logo on the front of the building, a firehouse where the men lounged in front of the station, just waiting. This sounds like a great book! 1 city I just disliked, Los Angeles. No center, no beating heart....no soul. I used to live in a town like that in Minnesota. I lived around the corner from the library, just a couple of blocks from the main street where I did my shopping and eating out, and if I rode my bike for 10 minutes in any direction, I was on farm roads. Loved it there. I have always said that about Houston-no soul. I've seen him speak on booktv. What he says makes a lot of sense. I currently don't really live in a city, but I can walk to work from where I live - I don't think I could go back to a long commute. I used to live in Minnesota, also. No one should have a long commute! It's so wrong on so many levels.